Flu got you feeling ugly? Has a cold kicked all the cute-ness from your face? Has a virus, virtually removed all color from your once colorful face? Here's how to look cute, or at least feel like you look better or cute, when you're sick with a cold, flu, or anything else making you feel "not-so-great"! As you probably know, I am sick as I type this...and I thought, "hey, what better time than to do a tutorial on how "look better when you don't feel better". 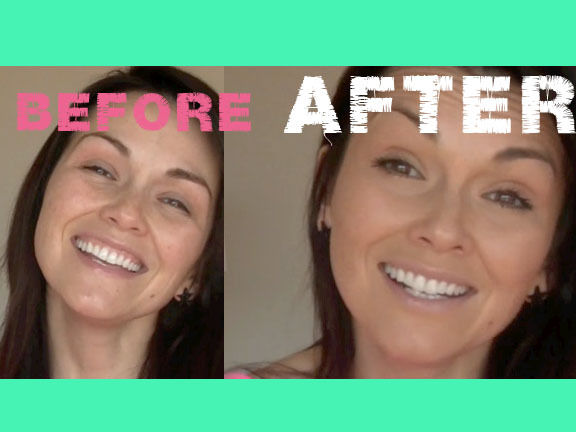 And since I don't really like to wear make-up when I'm sick, but you don't want to look so awful and washed out- here's my "make-up tutorial" for when you are feeling yucky. #1. Apply a Self-tanner to give to life and glow back to your face that your cold has robbed from you. #2. A little foundation can go a long way to knock our the redness of a cold. #3. Conceal the redness of the signature "rudolph the red-nosed sick person", with a little "heavier coverage foundation- it will be creamier than a concealer, which is great for how dry a cold makes the skin and nose area, already. #4. Add some contour, dimension and color to your face with concealer pencils. I don't like adding blush or dry bronzers when I'm sick, but you want to add some color so you don't look like your dead with just one foundation color all over. #5. Powder only where you feel needed. I just powder the eyelid area mostly, because I don't want my foundation or concealer to crease. Any powder will work. #6. Curl the stars of your face: the lashes and apply your fav mascara! #7. Last but not least- lips need some love and moisture. If you're blowing your nose and drinking as much water as you can, you don't want a bright color lipstick or gloss coming off on your tissue or water glass or tea mug. TIP: And perhaps one of the most important parts when you are sick- after you've kicked your cold or flu, you want to make sure you wash all your brushes that you used while you were sicky and make-sure you disinfect all your make-up (which you should always do anyway). And you don't want to use alcohol because it can dry out and change the consistency of your cosmetics as well as change the pigment too. I love and use BEAUTY SO CLEAN cosmetic disinfecting spray. I hope everyone who's sick feels better and if you are not sick, just save this in your "mind library" for the next time a cold or flu sneaks up on you!